Fixed income markets finished the quarter relatively flat as interest rates drifted higher. U.S. bonds returned -0.16% and municipal bonds earned 0.87%. The central bank increased the Federal Funds Rate by 25bps in June and increased the forecast from one to two additional rate hikes this year. The Fed chairman cited solid economic growth and stronger inflation expectations as reasons for the increase. Despite the central bank’s rate hikes and balance sheet reduction plan, financial conditions remain favorable. The historical average for the Federal Funds Rate is between 4-5%, much higher than the 2% rate today. As the Federal Reserve continues to normalize policy, volatility in bonds may persist. Given where we are in the economic cycle and the direction of interest rates, we find it paramount to own high quality bonds while being cautious of interest rate risk. Stock markets across the globe experienced very different outcomes. U.S. equities remained resilient, earning 3.89%. Elevated trade concerns and geopolitical risks were outweighed by strong fundamentals as tax reform continued to provide a short-term boost to the U.S. economy. International stocks finished down slightly, returning -0.75%. Political concerns around the far-right movement resurfaced and economic growth moderated from unsustainably high levels. On the bright side, international markets are still in the middle of an economic expansion and fundamentals remain positive. Emerging markets had the toughest quarter, returning -7.96%. Escalated trade threats between the U.S. and China, combined with a stronger U.S. dollar and negative headlines around Turkey and Brazil hurt emerging market stocks, but the outlook remains encouraging for long-term investors. We continue to see good growth, strong consumer activity, improved balance sheets, and attractive valuations in emerging markets. 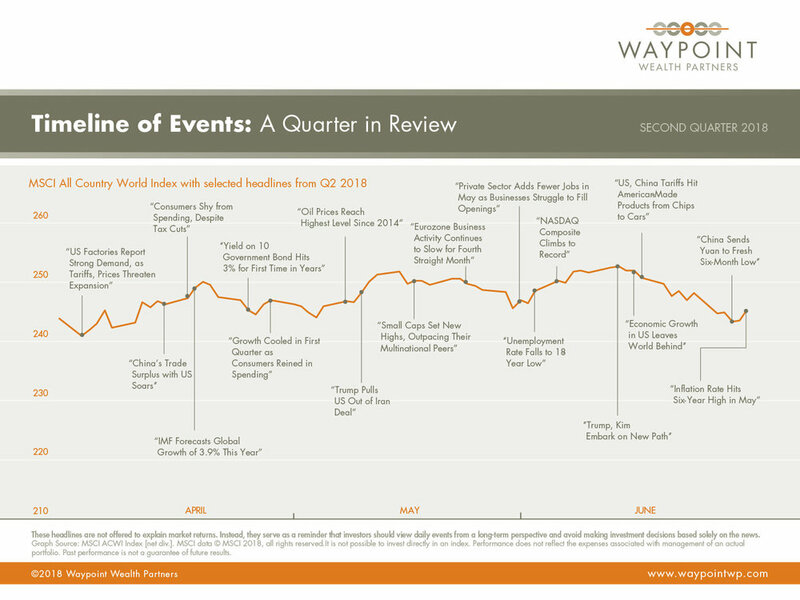 We anticipated trade threats would slow down global growth if tariffs were escalated and that played out this quarter. Global momentum cooled a bit from last year’s neck breaking pace, but it remains in positive territory. Trade tensions and bad weather in Europe and Japan contributed to the slowdown. While other countries around the world are experiencing some pause, the U.S. continues full steam ahead. Tax reform has provided a shot in the arm to the economy, taking growth above average. The U.S. is now in the tenth year of an economic expansion, the second longest on record. We expect economic growth to go back to normal levels in 2019 as benefits from fiscal stimulus diminish and interest rates rise due to strong growth and below average unemployment levels. All expressions of opinion are subject to change. This article is distributed for informational purposes, and it is not to be construed as an offer, solicitation, recommendation, or endorsement of any particular security, products, or services. Dimensional Fund Advisors LP is an investment advisor registered with the Securities and Exchange Commission.